An easy recipe for crab stuffed mushrooms with cream cheese. Low carb, keto, and gluten free. Preheat the oven to 400 F. Prepare a baking sheet lined with parchment paper. Snap stems from mushrooms, discarding the stems and placing the mushroom caps on the baking sheet 1 inch apart from each other. Season the mushroom caps with salt. In a large mixing bowl, combine all filling ingredients and stir until well-mixed without any lumps of cream cheese. Stuff the mushroom caps with the mixture. Evenly sprinkle parmesan cheese on top of the stuffed mushrooms. Bake at 400 F until the mushrooms are very tender and the stuffing is nicely browned on top, about 30 minutes. Top with parsley and serve while hot. 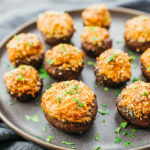 This recipe yields 5 g net carbs per serving (5-6 stuffed mushrooms).